Faster performance. Even on older devices, performance is improved with up to 40% faster app launch, 50% faster keyboard launch, and camera loading 70% faster. When you upgrade you will notice much improved performance with less stuttering and fewer frame drops. Augmented Reality improvements such as the Measure app allow the camera on newer iPhones to take a measurement of an object. Other AR improvements include using your iOS device to “see” items like a Fender guitar in your living room before you purchase it. If you are into AR games, iOS 12 allows multiple players and observers on separate iPads to observe gameplay from their respective viewpoints. Siri improvements include custom shortcuts with voice-triggered actions using WorkFlow, which was integrated into iOS 12, and can make calls or send texts for you whether you’re driving, have your hands full, or are simply on the go. Proactive suggestions — like texting someone that you’re running late for a meeting — let you stay in touch effortlessly. Photos app is improved with new intelligent search features that help you find, edit, and share your photos with suggestions designed for you, for example, in Messages based on who you’re chatting with, what you’re talking about, and where you’ve taken photos together. The “For You” tab shows great moments from your library, like family vacations and weddings, and uses face recognition to identify and suggest sharing photos with the people in them. And if the recipients are using iOS 12, they’ll be prompted to share their photos from the event with you, too. FaceTime improvements include upcoming support (to be released later this fall) for video and audio with up to 32 people at once. The tile of the person speaking gets larger automatically, so you’ll never lose track of the conversation. You can start Group FaceTime right from a group thread in Messages or join an active one at any time.. Emergency Location allows you to securely and automatically share your emergency location with 911 and others who care about you using HELO (Hybridized Emergency Location), which estimates a mobile 911 caller’s location using cell towers and on-device data sources like GPS and WiFi Access Points. Apple uses emergency technology company RapidSOS’s Internet Protocol-based data pipeline to quickly and securely share HELO location data with 911 centers, improving response time when lives and property are at risk. 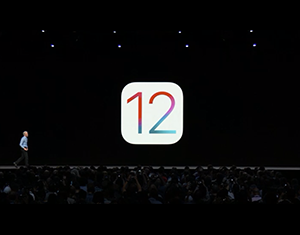 Device Usage apps have been integral for some time now, including the Do Not Disturb While Driving feature released in iOS 11. iOS 12 improves device usage with the new Notification Center mentioned earlier, as well as the new Screen Time feature that monitors your device usage and the usage of everyone in your family who uses Family Sharing. Family Sharing is still great for sharing music, movies, apps, and more, but now provides access to Screen Time data. You can view reports and adjust settings for children in your family any time, right from your device. Battery Health has improved with iOS 12. When you first update your phone, the operating system re-indexes a lot of content and performs a lengthy optimization process. This will initially make your iPhone feel a little slower and as though the battery doesn’t last as long, but once the processes are complete, you should see benefits. Animoji offers new features and faces, and lets you create your own Memoji. You must have an iPhone X, XS, or XR to use these features. There are additional improvements to the News, Stocks, Voice Memos, and Apple Books (formerly iBooks) apps including fresh redesigns of the interface. Read the entire list of updates here. To date, Connectech has not heard of any major issues or problems with this upgrade, other than a few charging issues for a handful of users. The new iOS 12.1 (2nd release) is due to be released within the next few weeks and includes over 70 new emojis plus a number of other minor improvements and bug fixes. If you’d like help upgrading your devices, please give us a call and we’d be happy to assist.